Vue Elasticsearch Tutorial With Node.js From Scratch is today’s leading topic. We build a frontend in Vue.js and then send a network request to the node.js server and node will query the data to the elastic server. It will get a response and send the JSON response back to the Vue.js client. Now, first, we create a Vue.js frontend and then create a node.js server and index all the data to the elastic-server. Then send a request to the node server and fetch the data. So it is pretty simple stuff to understand. You can find full documentation of elasticsearch here. 3 #Step 2: Create Bootstrap Form For Search. 4 #Step 3: Install Axios HTTP Promise based library. 5 #Step 4: Create node.js web server. 6 #Step 5: Install Elasticsearch on the local machine. 7 #Step 6: Create an index and indexing of data. 8 #Step 7: Create the query. 9 #Step 8: Display the queried data. Now let us dive into the programming. First, install Vue.js. We install Vue.js using VueCLI. So if you have not installed Vue CLI, then you can install it using the following command. Now create a new Vue.js project using the following command. Start the dev server using the following command. #Step 2: Create Bootstrap Form For Search. Now, install the Bootstrap 4 using the following command. Import the bootstrap 4 file inside src >> main.js file. Okay, replace the existing code by the following code inside App.vue file. Next step is to add the @keydown event to the search area. We need to do this because when the user starts typing in the search box, then we send a network request to the server with the search query and then get a result and display the result. So write the following code inside App.vue file. #Step 3: Install Axios HTTP Promise based library. Type the following command to install Axios Promise based HTTP library. We have not created the node.js server, but we will create in a minute. Bur first, we setup axios to send a network request to the server. Okay, now add the axios and vue-axios inside the main.js file. Finally, we can use Axios inside App.vue file. So, we will send a network request to the node.js server which is running at port 5000. Right now, it is not running because we have not created yet. So let us create in the next step. #Step 4: Create node.js web server. Inside your vue-elastic project, create one folder called server and inside that create one file called server.js. First, install the following node.js dependencies using the following command. Write the following code inside a server.js file. You can start this node.js server by typing the following command inside server folder. #Step 5: Install Elasticsearch on the local machine. If you have already installed Elasticsearch on the mac, then you do not need this step. Otherwise, you can continue with this step. 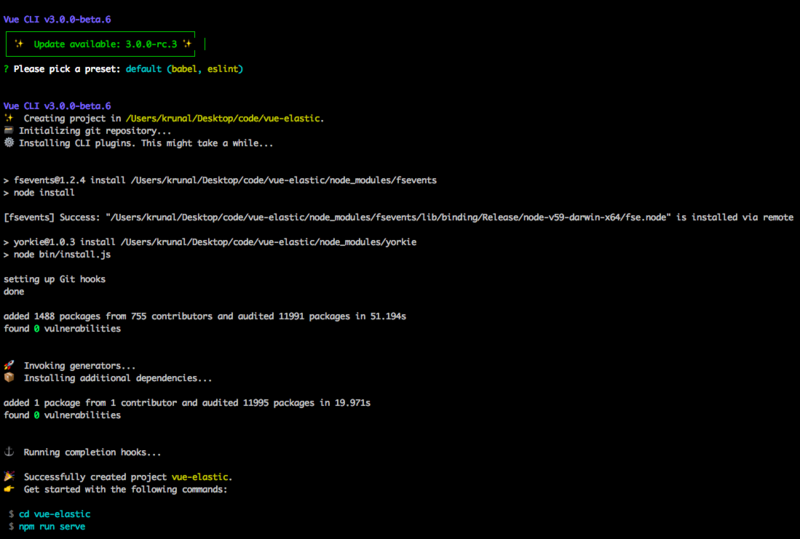 So type the following command to install Elasticsearch via homebrew. It will install it and now start the services using the following command. Now, we need to connect our node.js application to the elastic server. Now, restart the node.js server and see console. You can get like this in the console. #Step 6: Create an index and indexing of data. We need the data to index. So inside server folder, create one file called data.json and add the following code inside it. We will search some of the Game of Thrones main characters. Now, we need to index these data. So let us create another file inside server folder called elasticsearch.js and add the following code in it. Save the file and open the terminal inside the server folder and hit the following command. It will index the data. So now our game of thrones characters are ready to query. #Step 7: Create the query. Inside the server.js file, add the following code. So, finally when the user tries to search any phrase, it will get this get /search route, and we pass the query parameter. According to the query, it will find the results and send back to the client. #Step 8: Display the queried data. Inside App.vue file, add the following code. <div v-if="data" v-for="(value, index) in data"
Finally, we can search the data from Vue.js using elasticsearch. Vue Elasticsearch Tutorial is over. Thanks for taking.